1. Tongues are (or were) real languages not gibberish. 2. Speaking with tongues (i.e. miraculously speaking in a foreign language) was not meant to benefit believers, but to serve as a sign to persuade unbelievers. 4. The spiritual gift of tongues does not empower believers to speak a mysterious language. 5. “Praying in the spirit” or “praying in the Holy Ghost” is not a command to pray with tongues. 6. Paul criticizes, ridicules and discourages the practice of praying in tongues (without the gift of interpretation). 7. Speaking in tongues is useless unless there is an interpretation. 8. Not all believers are granted the gift of speaking with tongues. 9. God issues the command to be quiet in the church unless it is possible for the tongues to be understood (interpreted). 10. Since God is not the Author of confusion, speaking with tongues in church without providing a valid interpretation is not from God. 11. If tongues are spoken in the church, it should only be done by one person at a time, and then by no more than three persons in total. Therefore, a church collectively speaking in tongues is madness. 12. Women are not permitted to speak tongues in the church. 13. Tongues and other spiritual gifts will eventually cease. The words lâshôn [H3956] in the Hebrew and glōssa [G1100] in the Greek, literally refer to the tongue; a member of the body and the organ of speech located in the mouth. However, to lexicons of both the Old and New Testaments of the bible, this word tongue is figuratively used to refer to any “language or dialect used by a particular people distinct from that of other nations.”¹ In fact, the English words gloss and glossary are both derived from their cognate glōssa. Therefore, when the bible employs the word tongue to refer to the spiritual gift granted by the Holy Spirit to believers, it is the gift of speaking a foreign language that is in scope. This past Sunday, our pastor Lon Solomon preached an excellent and heart-moving sermon entitled: “Finishing Well” where he briefly surveyed the books of Philemon, 1 & 2 Timothy and Titus. In the course of his presentation he listed 4 suggestions which would help believers to finish well in accordance with Paul’s famous analogue about the Christian life as a race (1Co 9:24-25) in which the goal is not to start well but to finish well (2Ti 4:7-8). When I think about the idea of starting well, I am reminded of the Parable of the Sower and the Seed (in Mathew 13:20-21) where the second group that received the Word of God (the seeds that fell on stony ground) are said to have initially and immediately received the Word with joy; in other words, one could say that they started the race well. But as we read on we find out that they never finished the race. Why? Well, they did not begin the race with the intention of finishing the race. They had “no root” in themselves so that when tribulation and persecution arises (and we are promised that all Christians that follow the “How To Be a Christian” Manual AKA the Bible, WILL face persecution) these folks that started the race well end up dropping out of the race. They become castaways. Let us strive to finish well. 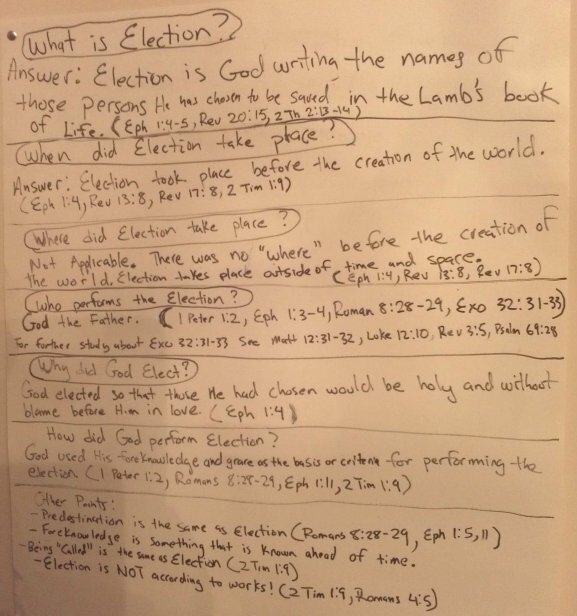 What does the Bible mean by Election? For more information about Exodus 32:31-33 see Matthew 12:31-32, Luke 12:10, Revelation 3:5, Psalm 69:28. When did Election take place? Where did Election take place? Why did Election take place? – Foreknowledge is information that is known ahead of time. Is there a difference between “trembling at God’s word” (Isa 66:2) and “fearing God” (Pro 1:7)? John 14:21 He who has My commandments and keeps them, he it is who loves Me. And he who loves Me shall be loved by My Father, and I will love him and will reveal Myself to him. John 14:22 Judas (not Iscariot) said to Him, Lord, how is it that You will reveal Yourself to us and not to the world? John 14:24 He who does not love Me does not keep My Words, and the Word which you hear is not Mine, but the Father’s who sent Me. To Believe in God is the same as to believe in His word. who says he believes Christ but does not believe His words is lying. John 8:31 Then Jesus said to the Jews who believed on Him, If you continue in My Word, you are My disciples indeed. Colossians 2:3 In whom (Christ) are hid ALL the treasures of wisdom and knowledge.